[JAN. 21, 2005] SPRINGFIELD -- Students who will be attending state universities in Illinois may submit applications for the General Assembly Scholarship program to the office of state Sen. Bill Brady, R-Bloomington, through March 19. Students whose permanent addresses lie within the 44th District are eligible. Eight one-year tuition waivers -- for fall 2005 and spring 2006 (excluding summer 2006) -- are available to students who will be attending state universities, with one specifically designated for a nursing student attending Illinois State University. The remaining eight summer 2006 portions of the scholarship are available for teachers who are continuing their education at a state-funded school. A panel of community and education leaders will evaluate applications and select scholarship recipients. Brady will not be involved in the decision-making process. Students are encouraged to request an application by writing to Brady's office at 2203 Eastland Drive, Suite 3, Bloomington, IL 61704. A request for an application should include the student's home and school address (if applicable) and phone numbers. All requests for applications must be sent in letter form to the district office. 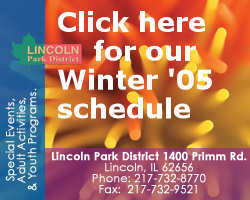 The phone number for the Bloomington office is (309) 664-4440.